Executing a great content marketing strategy may just be the answer you are looking for to help drive more quality traffic to your site, build your list, generate leads and make more sales. Instead of blanketing the known universe with crass commercial messages designed to hopefully catch attention and interrupt people’s lives… the goal is to provide useful information that is both appreciated and valued by those who are actively searching for a solution to their problems. Let me repeat that because it is important. The goal of any profitable “content marketing strategy” is to provide value-based, keyword rich content that can be easily found by potential customers who are ACTIVELY looking for more information about your product, service or business opportunity. Actively searching in real time. Right here. Right now. 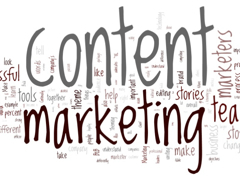 Content marketing means creating, publishing and promoting informational content (think blog posts, articles, white papers, and instructional videos) and promoting said content in order to make it readily available to your target marketing on demand – when they want it. In other words, a great content marketing strategy would seek first to understand exactly what your primary target market is actively looking for, create content to answer that expressed need in the market place, and then promote that content so it can be found easily. For example, chances are YOU sat down at your computer and typed the a specific search query like “content marketing strategy” or “what is content marketing” and spotting this post ranking high on the front page of your favor search engine. The headline caught your attention and here you are! Here are a few more article marketing tips. The secret to implementing a successful content marketing strategy is to put yourself in the customer’s shoes at the time they are have an active need or want to learn more about whatever it is you offer. Then look for ways to simplify and improve his or her life without recourse. Meaning freely offer incredible value first… before asking anything in return. This means using the same words and phrases in your marketing content materials that customers use in their search queries. In this example, we used the free Google Keyword Planner to conduct this keyword research. If you are looking for a more powerful, more automated solution that also gives you keen insights into the competition, see Market Samurai. Once you know exactly what your target market is searching for, then you simply optimize your content to address that specific issue. Publish, then promote the content by getting backlinks (which is a critical component to getting your content ranked in the SERPS so it can be found easily). You’ve heard the phrase, “Content is King” and, as you have experienced first hand, it is absolutely true because content and search drives the Internet. Your potential customers are constantly looking for information that solves a problem they are currently having. They are not looking for a sales pitch. They are seeking more information in order to help them make a decision to buy or to invest. People like to buy. People do not like to be sold. The trust, credibility, and authority content marketing creates knocks down sales resistance, all while providing a baseline introduction to the benefits of a particular product or service. This puts you in the position of being a trusted adviser versus an over-the-top, overly-aggressive, desperate salesperson. For more information about the value of creating a great content marketing strategy visit the Content Marketing Institute. There you will find a vast amount of statistics, resources, and case studies. Their focus is primarily B2B content marketing strategies but even the small business owner or network marketing professional can glean some wonderful ideas there. If you are an affiliate marketer or network marketer looking to start marketing content online, sign up for my free “Attraction Marketing Bootcamp” where we go over the exact step-by-step formula for success.